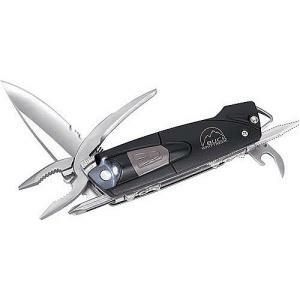 Weighing in at just over six ounces, it contains a 3-inch foldable 420HC steel blade, bottle opener, needle-nose pliers, 10-gauge wire cutters, a #2 Phillips screwdriver, slotted screwdriver, and an LED flashlight. It also comes in a durable nylon case. All features are easily accessible with one hand, and the tool looks when not in use for security and safety. The durable steel handle is easy to grip due to its thermoplastic sides. You can keep your multi-tool clipped to your key chain or backpack with an embedded metal lanyard loop. The X-Tract LED Multi Tool includes all the tools you'd need in the wilderness, all in a compact shell that fits easily in your pocket.